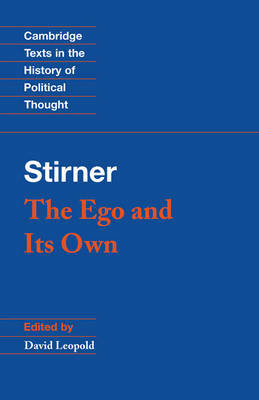 Max Stirner's The Ego and Its Own is striking and distinctive in both style and content. First published in 1844, Stirner's distinctive and powerful polemic sounded the death-knell of left Hegelianism, with its attack on Ludwig Feuerbach, Bruno and Edgar Bauer, Moses Hess and others. It also constitutes an enduring critique of both liberalism and socialism from the perspective of an extreme eccentric individualism. Karl Marx was only one of many contemporaries provoked into a lengthy rebuttal of Stirner's argument. Stirner has been portrayed, variously, as a precursor of Nietzsche (both stylistically and substantively), a forerunner of existentialism and as an individualist anarchist. This edition of his work comprises a revised version of Steven Byington's much praised translation, together with an introduction and notes on the historical background to Stirner's text.